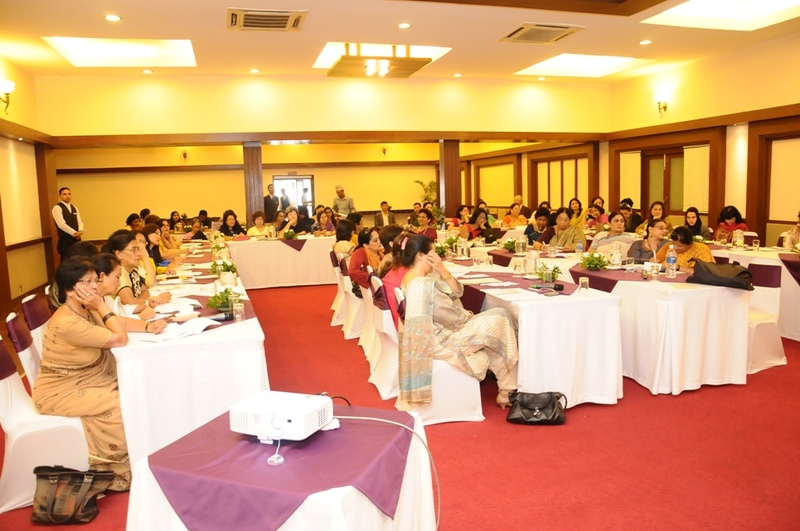 Brought together more than 60 eminent women from 9 nations (the eight SAARC nations and Myanmar). Prime Minister of Nepal Dr Baburam Bhattarai sent a written message congratulating SWAN on this occasion. 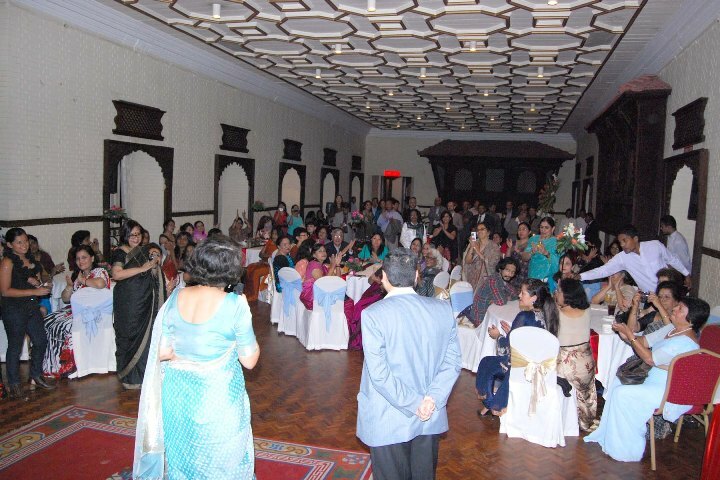 Nepal’s Minister for Women’s Children’s and Social Welfare was the Chief Guest at the Inaugural Session. SAF’s support for and participation in the Conference was prominently recognised in my Introductory Speech at the Inaugural Session, as well as through the SAF logo used on the banners and files and all publicity material for the Conference. 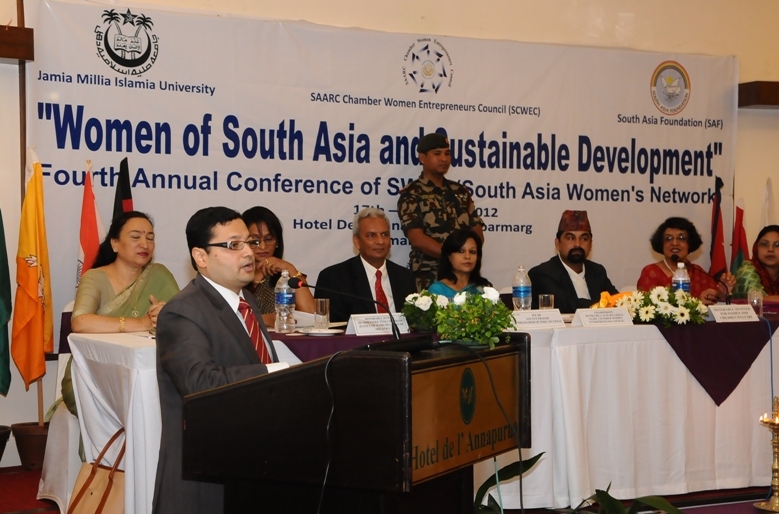 The theme of this year’s Conference was “Women of South Asia and Sustainable Development”. The Conference assessed that the failure of the recently concluded Rio+20 Summit (UN Conference on Sustainable Development) to provide hope for a sustainable future for all can only be taken as a critical call for collective civil society action with women at the centre of leadership. 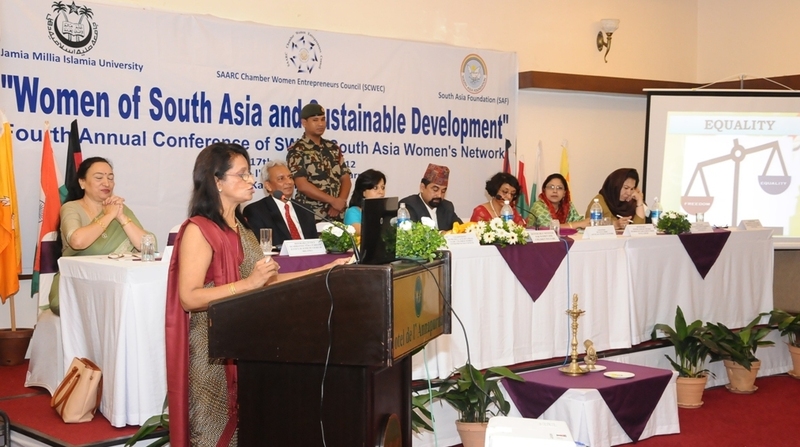 Convinced about the centrality of women’s agency, voice, participation and leadership in the achievement of all the three dimensions of sustainable development (social, economic and environmental), the Conference declared its determination to formulate and undertake programmes and actions in order to implement its vision for sustainable and equitable development in South Asia. 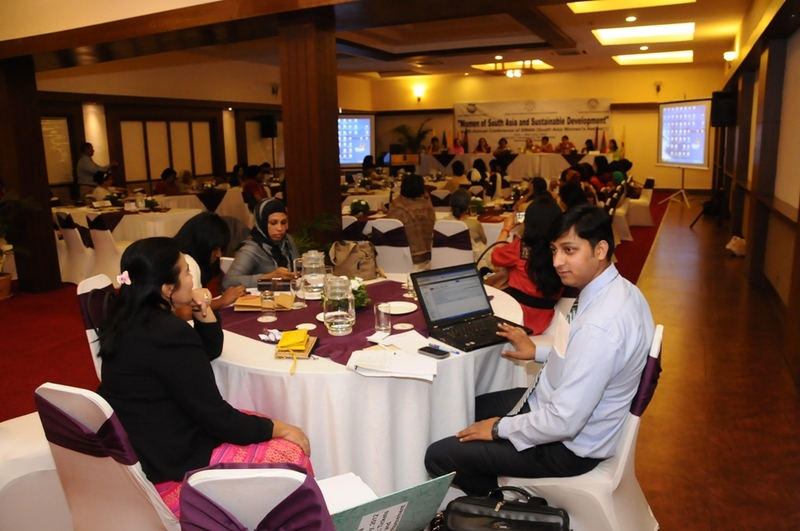 Towards this end, the Fourth Annual Conference of SWAN has, through its Kathmandu Declaration, proposed a Roadmap for Sustainable Development for the Women of South Asia. The strategic approach for implementing this Roadmap is based on regional cooperation through establishing partnerships across all nine SWAN nations for advocacy, leadership development and capacity building for change at all levels. Innovative initiatives have been proposed at the grassroots, community and policy levels across South Asia, so as to create sustainable models for the future, bringing in the centrality of women’s empowerment as an intrinsic part of this process. The SWAN methodology for implementing this Roadmap is through a series of workshops covering all the eight sector networks, which are also called SWANs. 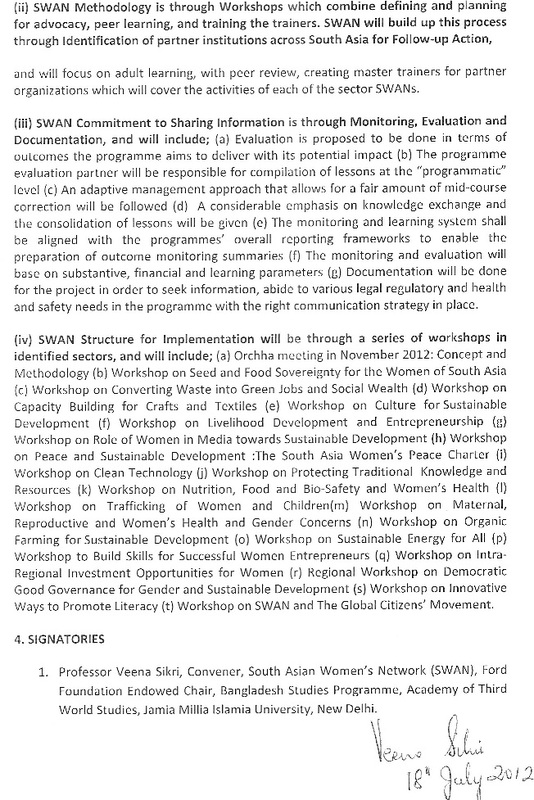 Twenty such workshops have been proposed over the next four years, with the themes for each listed in SWAN’s Kathmandu Declaration. These workshops combine defining and planning for advocacy, peer learning and training the trainers. 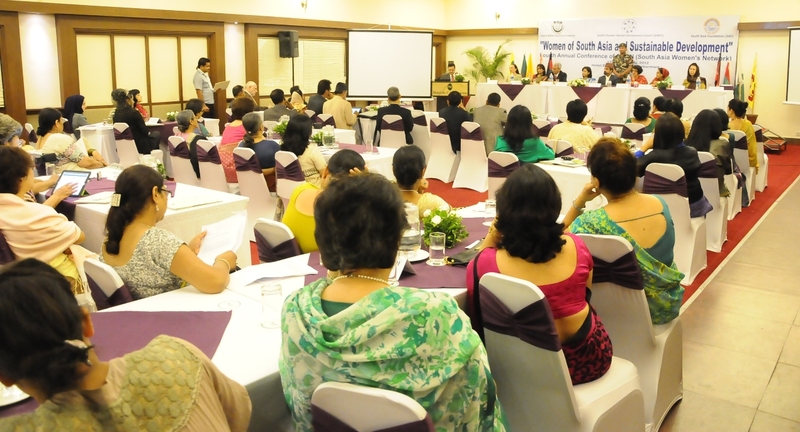 The Fifth Annual Conference of the South Asia Women’s Network (SWAN), dedicated to the theme “Gender Equity for Peace and Sustainable Development for the Women of South Asia”, was supported with US $50,000 from South Asia Foundation-India (SAF-India). 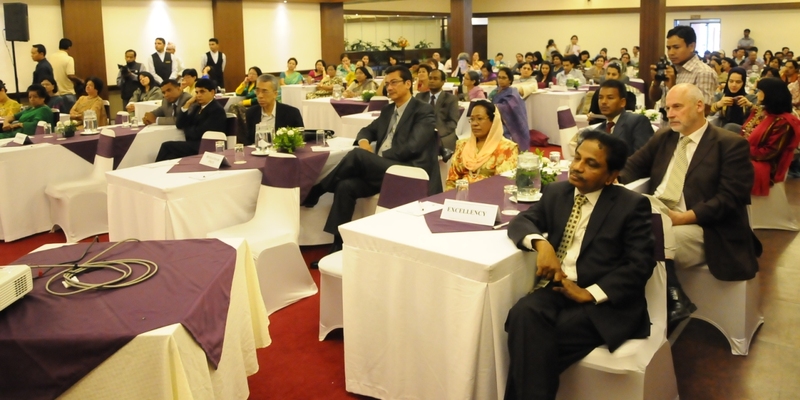 About 100 delegates from SAARC Countries and Myanmar participated in the Conference. The Conference was inaugurated by Hon. Basil Rajapaksa, Minister for Economic Development, Sri Lanka. We, the women of South Asia, gathered in Kathmandu, Nepal on July 17 and 18, 2012, for the Fourth Annual Conference of SWAN (South Asia Women’s Network), which was dedicated to the theme of “Women of South Asia and Sustainable Development” are convinced that the failure of the Rio+20 Summit (UN Conference on Sustainable Development) to provide hope for a sustainable future for all can only be taken as a critical call for collective civil society action with women at the centre of leadership. Convinced about the centrality of women’s agency, voice, participation and leadership in the achievement of all the three dimensions of sustainable development (social, economic and environmental), we announce our determination to formulate and undertake programmes and actions in order to implement our vision for sustainable and equitable development in South Asia. We come from nine South Asian countries: Afghanistan, Bangladesh, Bhutan, India, Myanmar, Maldives, Nepal, Pakistan, and Sri Lanka. The SWAN Annual Conference brings together eight individual SWAN networks, respectively on Arts and Literature; Women in Peacemaking; Health, Nutrition, and Food Security; Education; Crafts and Textiles; Livelihood Development and Entrepreneurship; Environment; and Women in Media. 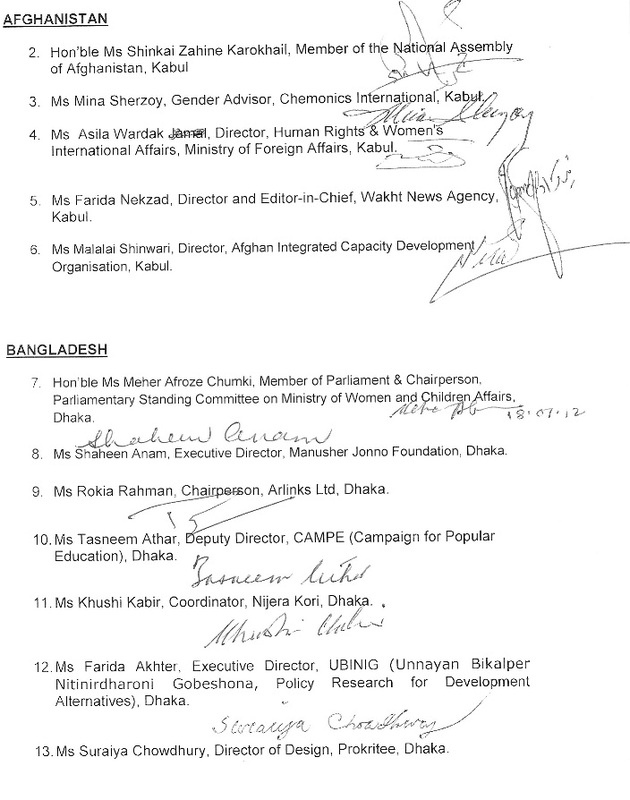 The Dhaka Declaration on “SWAN’s Position on an Emerging Green Economy” adopted at the Third Annual Conference of SWAN (2‐3 July 2011), had reaffirmed that “the right to sustainable development should be inalienable”, particularly since “this is vital for women’s empowerment and for preserving our planet for future generations”. The Dhaka Declaration emphasized that “women of South Asia bear the highest burden of climate change, biodiversity erosion and unsustainable forms of urbanization.” In the aftermath of Rio+20, where the people’s vision and aspirations for equity, planetary protection and ecological democracy was repeatedly disregarded in the Outcome Document at Rio+20, ironically called the Future We Want, the need to amplify our voices becomes compelling. 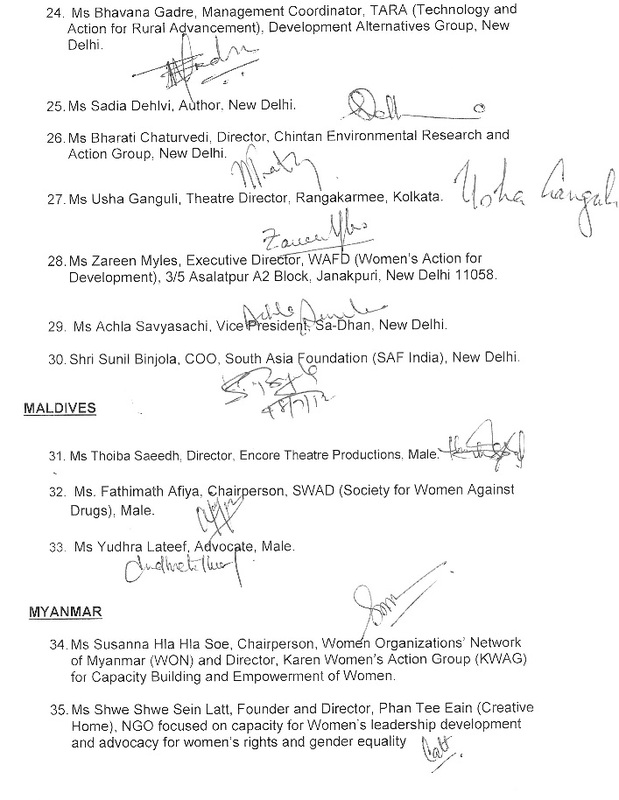 Having determined that the Rio+20 Summit has been unable to fulfill even the most modest expectations through its outcome, we the women of South Asia wish to reconfirm our commitment to provide the necessary leadership at the regional and global levels. We express the urgency of advancing a Global Citizens Movement that can foster a transition to sustainability. 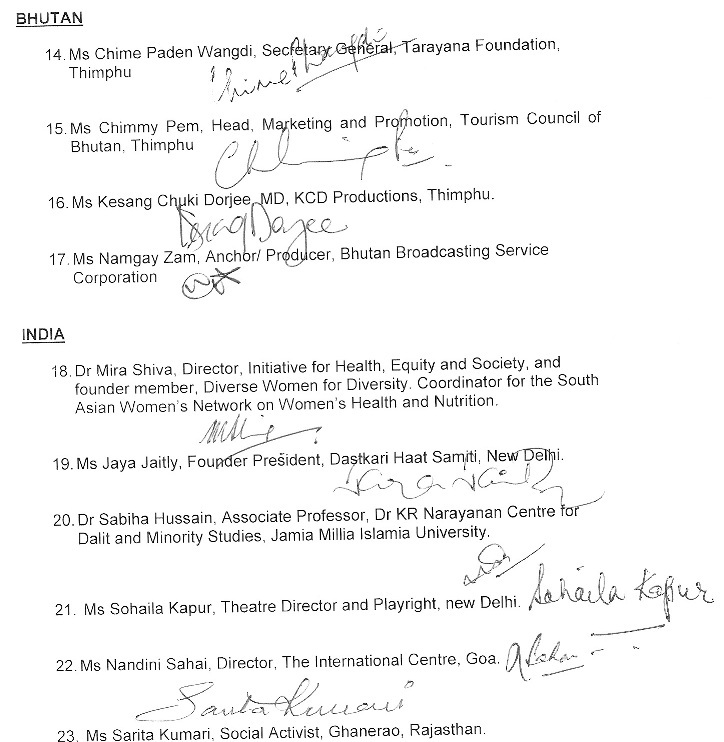 Therefore, SWAN agrees to put forward through its Kathmandu Declaration, the “Roadmap to Sustainable Development for the Women of South Asia”. 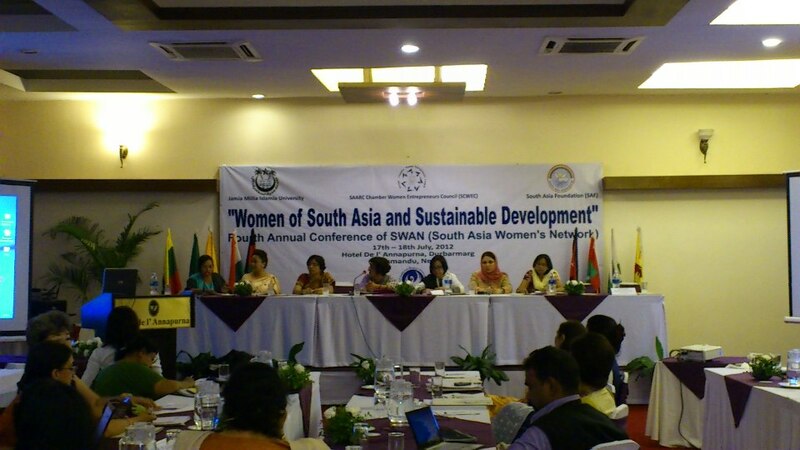 We have come together through SWAN, a regional women’s movement, with the objective of empowering the women of South Asia to lead the transition to sustainability. The Outcome Document of the Rio+20 Summit did not include any substantial or substantive goals for achieving Gender Equity. As Rio+20 had overlooked the expectations of the women’s groups, it is now up to all community groups and consortiums on women’s issues to work relentlessly in pushing the agenda for gender equality and gender empowerment. We must ensure that women are heard and included by all governments and UN agencies in the formation and implementation of national, regional and global polices. Localizing our systems of economies, decentralizing governance, and advancing sustainable lifestyles and livelihoods becomes the new social order of sustainable societies founded on equity. A New Social Order based on democratic governance for a just and equitable society. A New Ecological Order based on sustainable consumption, lifestyles and livelihoods that respect our planet. A New Economic Order based on a system of access to, distribution of and control over resources by women from marginalized communities. The core idea of sustainable economies must be poverty alleviation, environmental sustainability through maintaining all natural resources and the well‐being of all the people. Reversing the reduced access to the commons, which has led to loss of access to resources and sustainable livelihoods for women. Women’s creativity, entrepreneurship, capabilities and education which serve as the backbone of sustainable development. Emerging alternative to the prevalent economy, viz, an economic system that ensures sustainability through social justice and equity, protects the ecological balance and creates economic sufficiency; the core idea of sustainable economies must be poverty alleviation, environmental sustainability through maintaining biodiversity and all natural resources, and the well‐being of all people. Complementing the emphasis on the efficient use of resources with the concept of sufficiency achieved through mindfulness, sharing, and local sourcing; sufficiency extends to a sharing and caring society, which thus transcends into holistic approach towards sustainable living. Multidimensional Sustainable Development (SD) indicators viz. Gross National Happiness (GNH), Human Development Index (HDI), Ecological Footprint (EF) that show the links among a community’s economy, environment, and society. Strengthening political commitment to sustainable development, fostering strategic partnerships for gender equality, encompassing support from relevant institutions, ensuring sufficient access to financial resources and the participation of women at all levels of decision‐making. Ensuring peace in the region as a pre‐requisite for sustainable development, holding governments accountable and answerable to women for crimes committed against them and punishing those responsible. When women are safe, so are nations. When women feel secure, peace is possible. Including women at all levels of decision making and conflict resolution in order to achieve sustainable development goals, founded on equity, justice, democracy and peace. The SWAN strategic approach is based on partnership for advocacy, leadership development and capacity building for change at all levels. SWAN Advocacy: i. SWAN will work at the national, regional and global levels towards bringing in gender equity based sustainable development policies. SWAN will resist policies that perpetuate inequity and injustice. 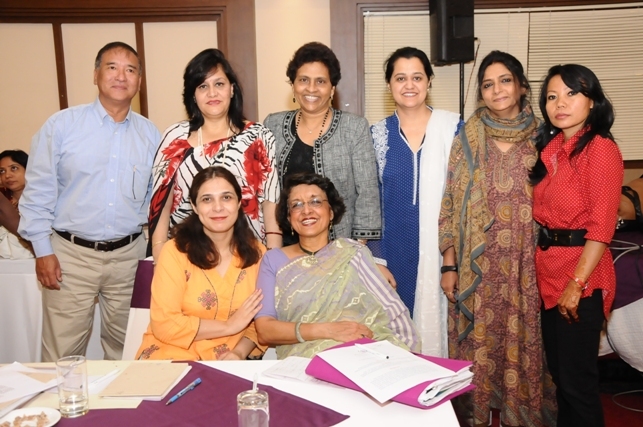 Within South Asia SWAN will build capacity through knowledge exchange for policy recommendations. ii. SWAN Leadership Development: SWAN will nurture leadership within its members to implement and monitor sustainable development policies and programmes. iii. SWAN Capacity Building for Change at All Levels: SWAN will enhance capacity to build programmes that demonstrate and scale‐up best practices for sustainable development. 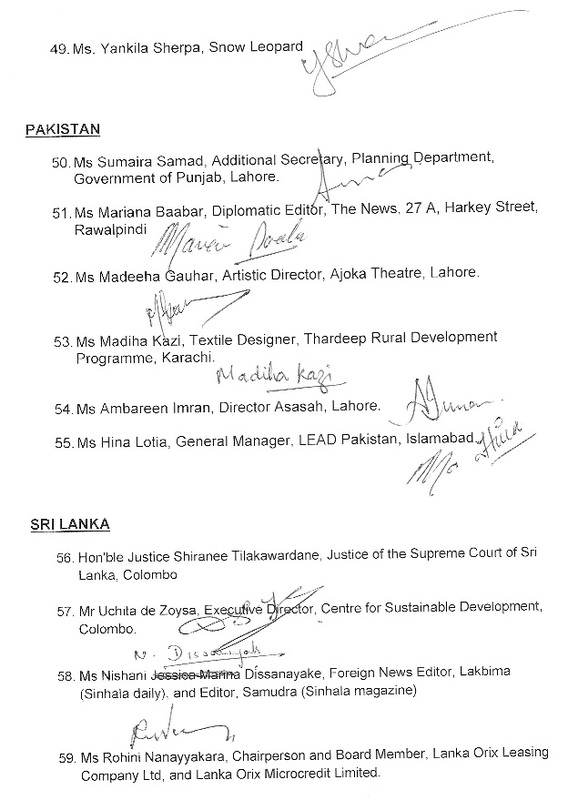 (i) SWAN’s Concept of Empowerment of the Women of South Asia is through Partnership and Capacity Building, that acknowledges; (a) In South Asia, while national policy makers have accepted the need to systematically pursue gender equality, there are still enormous lacunae and barriers on critical issues (b) The goals of sustainable development cannot be achieved without the strong and significant focus on removing gender inequality and discrimination (c) In spite of several outstanding examples of individual and collective achievements by women across South Asia, woman still constitute a large body of under ‐ privileged citizens and they survive within the limits of an environment that is increasingly hostile and rapidly degrading (d) Innovative initiatives need to be taken at the grassroots, community and policy level across South Asia, so as to create sustainable models for the future, bringing in the centrality of women’s empowerment as an intrinsic part of this process (e) Partnership between the institutional network covering each of the nine nations participating in SWAN agrees to establish SWAN centres to work on and take forward the concept of regional cooperation for sustainable development for the women of South Asia.